Llama Llama and the Bully Goat is on a 1.5 AR level. 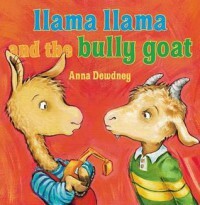 This story is about Llama Llama and his friends who are picked on at school by Gilroy Goat. Llama Llama and his friends do not like being picked on, so Llama Llama and his friends do the responsible thing and tell an adult. The teacher chats with Gilroy Goat and he ultimately becomes friends with the other children. I would use this book in my classroom at the beginning of the year to compare and contrast nice behaviors. We could then discuss which characteristics we look for in a friend and which characteristics point to a bully.